Eagle Air's first All Black Beech 1900D positioned from Hamilton to Auckland this morning and operated its first flight in the black scheme as NZ2151 to Gisborne. 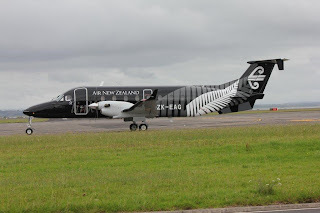 A few features of the scheme compared to the Airbus 320s; the large koru, the "Link" titles moved to the front passenger door, the white engine cowlings (enabling the cowlings to be swapped between aircraft) and the "Operated by Eagle Airways Ltd" titles under the pilots windiw. A second Beech, ZK-EAK, is currently in the paint shop.